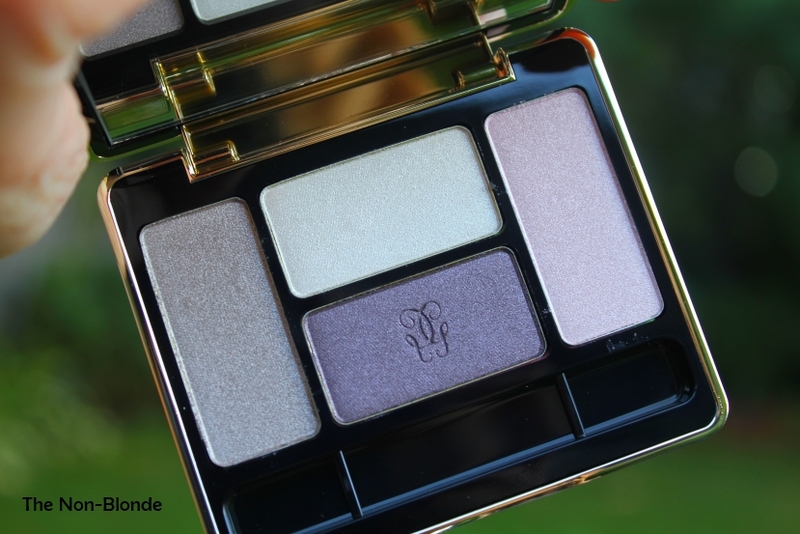 It's true that there's something for everyone in Guerlain's Fall 2011 Ecrin 4 Couleurs, the four-color eye shadow palette line that includes nine different palettes. In fact. one could easily scoop up several of these beauties. This year's Ecrin Couleurs range is a little less lavish than the 6 color palettes from fall 2010 with their ornamental compacts and hefty price tag. The Ecrin 4 Couleurs are more color-focused and have a simple elegance that makes them very French. 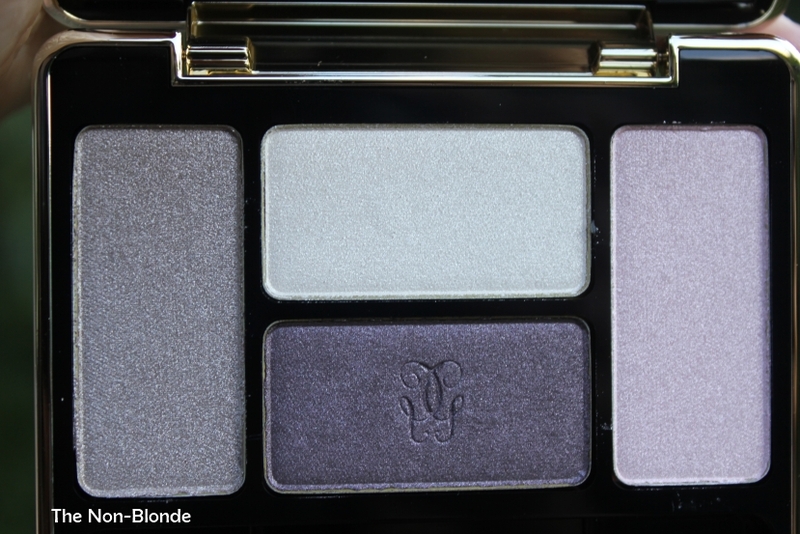 Some of the colors in the new Guerlain palettes are closely related to the 6 packs from last year. Since I have two of them, 2 Place Vendome and 93 Rue de Passy, I felt that I could skip most of the new sets and focus on just one, the very special Les Perles 08. Unlike the other eight compacts that include a range of iridescent, matte, satin and metallic shadows, Les Perles is all about the pearly finish, though the darkest shade in this palette is more satiny. Please click on the photos to see them in full (and please forgive my cat scratches and mosquito bites). 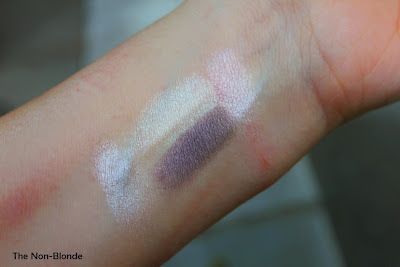 The three light shades look like highlighters when you first swatch them. 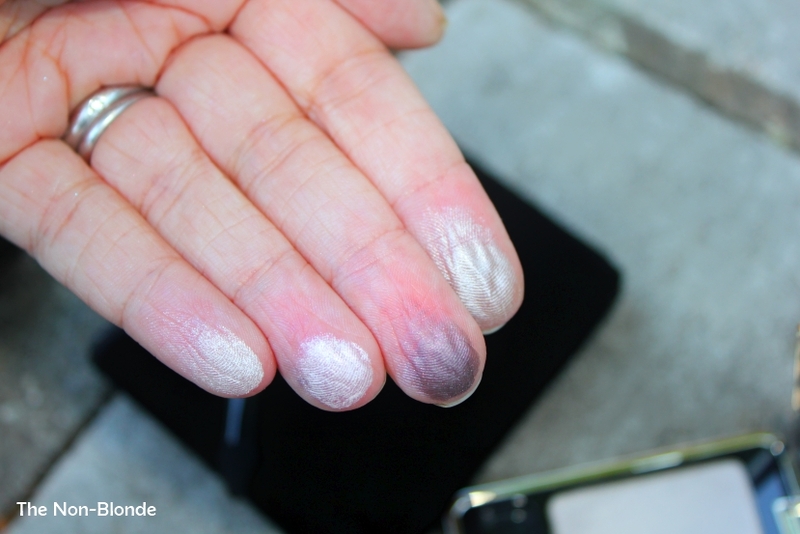 However, they have such pigment intensity that they actually belong on the lids, imparting a delicate color accent. Applied lightly with a good brush over a primer (I find that Guerlain's wonderful eye base is incredibly similar to my Paula Dorf), these shades are beautiful and not really frosty- they gleam and open up the eye area. The three light shades have pearl-white, silver and shell pink leanings, so you can choose the right one to coordinate with the rest of the look. Then blend with the gorgeous cool taupe. A thin black liner and mascara will complete the look. I asked the Gueralin makeup artist to convince me the quad is daytime-appropriate. It is. All this set takes is a soft blending brush and simple application to create a pretty and neutral look. The pearly shadows give a veil of delicate light while the taupe creates dimension. Of course, you can pack the colors on for evening, but at least now, during the last weeks of summer, a light touch is enough. Bottom Line: I chose well. Guerlain Les Perles 08 Ecrin 4 Couleurs Eye Shadow Palette ($59) and the rest of the line are available at the counters. its killing me that these aren't out in europe yet! Is this limited edition? If it is $59 in the US, its going to almost be $80 in Australia! I need time to save money for this!! I have my eye on 3 of these palettes and one of them is that one. They look so lovely. Oh gosh, these look awesomely pretty and just my thing (love cloudy blues!) Bad Gaia, bad, giving me lemmings so soon! which fall palette is your absolutely must have? i can only afford one. thanks!